For decades Aussies have dreamed of the great road trip, the perfect opportunity to travel the 7.692 Million square kilometres we call home. Since the motorcar was invented holidays featured 4 wheels, cruising to new unknown destinations and for many a hunt for accommodation. In 1947 Jim Darlington, a passionate Australian dipped his hat into the emerging caravan market and Millard Caravans was born. A family owned and run business, Millard caravans grew from strength to strength as passion for creating a caravan better than competitor options drove the family to success. 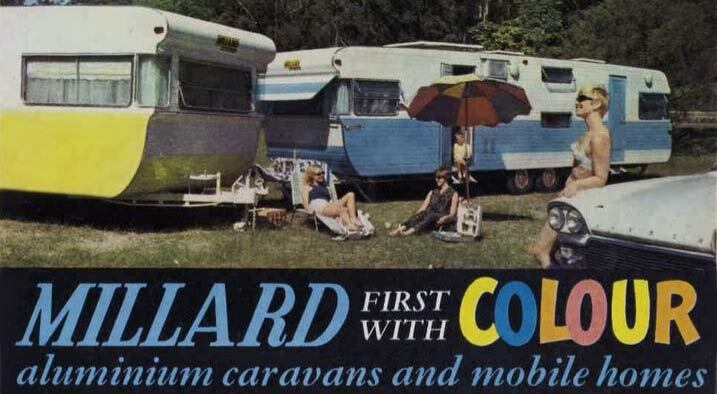 At the time a distaste for the silver or green colour options by the wife of John Darlington (Jim’s son) even lead to coloured caravans and modern internal fittings that continue to make Millard caravans such a stand out in the Australian caravan market. With the increase in popularity of caravans – the “home away from home on wheels”, this accommodation hunt is no longer a barrier to the great road trip. Those passionate about seeing the stunning country around us can do so from the comfort of their ‘mobile home’, enjoying spacious caravans fully fitted with Millard caravan standards such as full ensuite with shower and toilet, kitchen, dining area, bedroom, storage space and safety and security. With an affordable, stylish and quality options in the caravan market the great Aussie road trip continues to lose its barriers. The dream of travelling from side to side of the country, top to bottom, coast to desert in a Millard Caravan is more affordable and easy to arrange than many believe. At Tweed Coast Caravan Sales in Tweed Heads South, NSW our experienced and welcoming team can’t wait to help with your caravanning adventure. Whether purchasing a quality van from our current stock list, or customising a van off the brochure you can rest assured your Millard Caravan is right for you. Many people search for caravans in Queensland, Brisbane and the Gold Coast. Our proximity to these locations as well as northern New South Wales locations means we can service your needs. Even if you live outside of these areas we are able to arrange caravan deliveries so your Millard Caravan can be delivered right to your door ready for your next adventure. To find out more about our Millard Caravan range view our New Millard Caravans listing or call us on (07) 5524 3745.